This Sadhana involves chanting Janjiras. Janjiras are similar to Bhajans. 1. This Sadhana has to be commenced on the first Tuesday of a Shukla Paksha or on Ram Navami or Hanuman Jayanti or Diwali. This is a 21-day Sadhana. 2. Firstly, In Brahma Muhurat, before leaving from home, the practitioner should do Dhyaan and 1 round of Ganapati Mantra and take his blessings by asking him for success in the Mantra Sadhana. 3. He should then do Dhyaan and Mantra Japa 11 rounds of any of six lettered Rama Mantras I am giving. 4. He should then go to a Hanuman Mandir where no one has gone since years and, which is located in a secluded and remote place. One can find such Mandirs in hilly regions. 3. Do Shodashopchara Pujan of Hanuman and pray to him to bless you with success in the Sadhana. 4. Now, Brahma Muhurat starts 1 hour 36 minutes before sunrise and all the things that I have mentioned till now may not get completed within the Brahma Muhurat. In such a case, the Sadhak can start the above-mentioned Dhyaan before the Brahma Muhurat. But, the main Hanuman Pujan should be done within the Brahma Muhurat. 5. The Sadhak needs to sit on a Kush Aasan near an Aak Plant with just the main plant coming out of soil. i.e. an Aak Plant, which has no branches. The plant has to be small, as it has to be plucked from the ground afterwards. 6. Now, sitting in front of the Aak Plant on a Kush Aasan, the Sadhak has to do Pujan of the plant using Haldi, Kumkum, Incense Sticks, Coconut, Kapur, etc. 7. After that, He needs to take teaspoonful water in his hand recite Janjira 1 and then offer it to the root of the plant. 9. Now, again, take a teaspoonful of water in your hand, recite Janjira 2 and offer the water the root of the plant. Do this also 21 times. 10. Now recite Guru Mantra 11 times and then leave for your home. 11.This entire process has to be repeated for 21 days. 12. On the 21st day, Lord Hanuman will give you Darshan. Do take a Sweet Bhojan with you to give it to him. 13. When he comes, recite Janjira 2 and he will start speaking. Do Shashtang Namaskar. Say Jay Shri Rama. He will tell you to ask for a wish. Be specific in your wish. If you have, some unfilled wish then ask that or else take a Vachan from him that "Whenever problems come or whenever I need your help you'll come and help me out and under no circumstances will you cause any kind of trouble to me". 15. Then you have to make a locket or amulet of the root of the plant and then wear it on your neck or on your waist. 16. Whenever you need help, recite Janjira 01 11 times. Lord Hanuman will come in front of you. Guidelines- 1) It is not meant for everyone. This Sadhana can only be done by an advanced Sadhak. 2) If the Sadhak's house has a female member undergoing her monthly cycles then under no circumstances should this Sadhana be done. 3)It is the kind of Sadhana will give lots of hardships to the Sadhak but what you should know that what you are trying to achieve is not a small feat. 4) It has also been seen that it may happen that suddenly a lot of monkeys may come and obstruct your Sadhana. A lot of snakes also may come during the Sadhana; trees may fall in front of you while you are on your way to the Aak Plant, etc. While doing the Sadhana you may hear lots of scary noises, which you may have never heard before so one must have enough mental strength. 6)Siddhi over the above-mentioned Mantra has to be achieved on a Shukla Paksha Tuesday in any Hanuman Temple by reciting it 1008 times. 8) If you still feel unsafe or if problems still don’t stop recite Rama Raksha Stotra, Kali Kavach, Bhairav Kavach, Narasimha Kavach with utmost attention. 9) If still problems keep on coming, keep on reciting Narasimha Kavach or Maha Mrityunjay Kavach till you're about to start the Sadhana. Narasimha kavach is ultimate. Keep on remembering him if your ghosts are still coming or if you are still hearing scary noises. Lord Narasimha will definitely protect you. And If this too doesn't stop the problems, ghosts, pisach,etc. start reciting Bajrang Baan. 11) While doing the Sadhana, the Sadhak should not fear or he will go mad or die. 12) If the Sadhak feels that he cannot contain the fear anymore he should start reciting Gayatri Mantra followed by the six lettered Rama mantra or the Hare Rama Hare Krishna Mantra till his fear doesn’t go away. 13) The Sadhak should follow the 5 Yam and 5 Niyam. 14) If there ever comes a situation where you don't know what to do, you should recite Gayatri Mantra and pray to Gods to help you. 16) No one should know you're doing this Sadhana and no one should see you while doing this Sadhana. 17) Every day before leaving for your home, recite Narasimha Kavach, Kali Kavach and Bhairav Kavach and then leave for your home and while going home don't look back even once. You may hear lots of strange noises while you go back home, if that happens keep on chanting the Gayatri Mantra but do not under any circumstances look back. 18) On the 21st day, It may happen that you may not see him right away. But that is fine, on finishing the last day's Sadhana leave for your home. It has been experienced that while going back if you start hearing a "Gurur Gurur" kind of sound in your ear it means he has come. However, it may happen that you will hear some different kind of sound but you yourself will understand that he has come. This day too, do not look over your shoulder. If you feel that he has come, request him to give you darshan. 20) It is a fact and personally experienced that the last 2-3 days before he comes is the time when you will face the most scary and dangerous situations. 21) I have provided with the most powerful ways to protect oneself from any kind of perils and that is enough. However, you can do whatever more you want to. There is no bar. 22) The main procedure from leaving home, doing the Pujan of the Aak Plant to coming back home needs to happen within the Brahma Muhurat as that is the time period when you are going to get the Darshan of Hanuman on the 21st day. 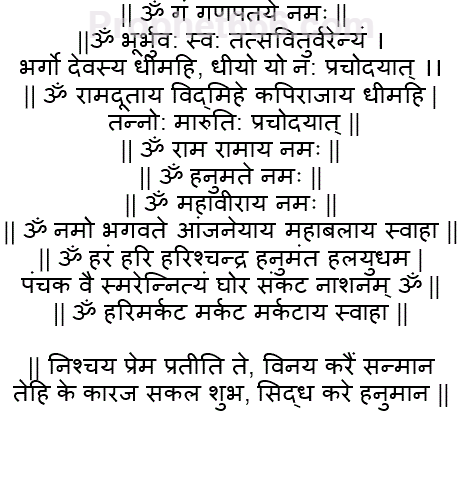 23) The kavach has the be recited with all nyaas. 24) I have mentioned almost all the things including the things that may happen during the sadhana but something else can also happen. Hence, Every day, recite Gayatri mantra, Hare Rama Hare Krishna mantra and Guru mantra. These mantras are going to be your savior. Looks like a very powerful sadhana for advanced sadhak not for layperson.. Well thank you for this information guruji.. I know another sadhna which invokes 21 Veers at once, but the risks are also greater. Look at piont number 10 in this same post , theres the exact mantra that you want . However I am not sure how to do siddhi of that. First of all Hats-off to Neel Sir for the noble work he is doing & to Ashok Sir for such a Powerful Sadhna. Sir I am a devotee of Hanuman since childhood. I don't know how my attention got to Lord Hanuman as I used to do Durga Chalisa at that time. But like something forcefully pulled/attracted me to pray Lord Hanuman. Sir I am in a business for last 2 years which went very smoothly in begining but with passage of time, it has come to verge of collapsing. I consulted some astrologers & yogis, they told that some one has done Black Magic for my Health & Business, but anyhow I am able to survive with blessings of Lord Hanuman. 1. Sir kindly tell me some Siddhi/Puja/Anushthan related to Lord Hanuman Ji to break Black Magic & be protected in future also. 2. Sir Hanuman Jayanti is coming on 22nd. I keep fast on Hanuman Jayanti every year. Kindly tell me proper method and Mantra to worship on Hanuman Jayanti. Sincerely thankful to you Sir. hey mail me I can help you. Very much interesting article . I have a question . In point number 10 , theres a shabar raksha mantra invoking Ganapati , Hanumant , Bhairav and Lord Narsimha . How to achieve siddhi over the mantra ? Thank you for such great article . DO you have authentic sadhana sadhanas of Manibhadra Yaksha or Apsara Sadhana like urvashi or Some information related to the "Mudras Of Apsara Sadhana " ? You can recite the mantra 108 times on 14th April guru pushya nakshatra. After that seven or eleven times everyday, and sprinkle water around you. One of the most powerful mantra for protection, also there is a different version of the same mantra. Can you please confirm which hanuman protection mantra is correct (i mean pronounciation). "ॐ नमो वज्र का कोठा जिसमे पिंण्ड हमारा पैठा ईश्वर कुंजी | ब्रह्मा का ताला | मरे अठों नाथ का मती हनुमंत रखवाला |"
However, few wordings in the one shared in this post looks quiet different. Please confirm which one should we recite. If theres anyone who wants to advance in sadhanas and having problems or real life problems but ardent vaishnava or hanumana devotee can contact me as we have prepared special siddha bajrang kavach maala consisting of original red coral with some special add-ons.This maala itself represents Lord hanuman.Who ever wears it aropund it's neck has full time protection of lord hanuman in all conditions, all his problems are solved within few months, the person's spiritual level enhances multiple times due energy of hanuman. Pratyaksha darshan of lord rama and hanuman is possible with a special sadhana done with maala and all wishes are fulfilled.Mala takes lot of time and energy for making so if theres devotee of hanuman who can afford it is welcome, but threr arerules for wearing it. All conditions sadhanas will be told after some one contacts.Mind you this mala is really a boon for vaishnavas and hanuman siddhas. 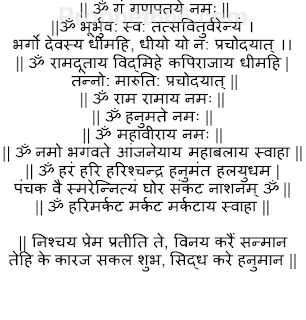 doubt in 12th point shud we recite all those mantras everyday or only wen we face fear? Can anyone translate the janjiras please?